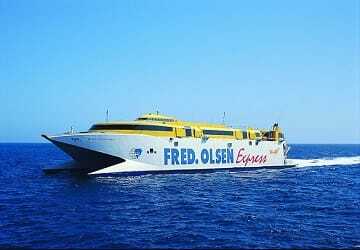 Bencomo Express was first introduced to the Fred Olsen fleet in 1999 and ever since has operated a reliable service between Gran Canaria and Tenerife. 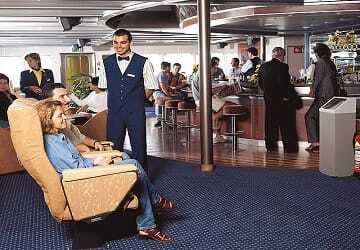 On board the 859 capacity ship passengers can enjoy numerous facilities such as, numerous bars, boutique, comfortable seating and a well-lit lounge. 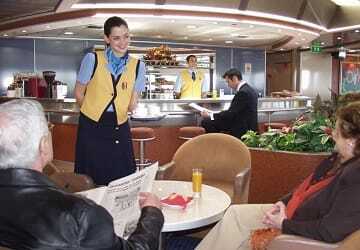 Please Note: Whilst we have taken great care in making our Bencomo Express guide as accurate as possible, onboard facilities, services and entertainment may vary depending on the date and time of year that you travel, facilities mentioned may change without notification and ferry companies reserve the right to operate vessels other than those mentioned at time of booking without prior notification. Had problems trying to book using Olsens website and also when I called their offices direct. It was so much easier and better when I called Direct Ferries, they made the whole booking process very simple and understandable. Thanks for a great service. Really nice trip, I recommend it to all! We experienced a trouble free crossing in both directions in comfortable conditions. The help of the crew on the return journey was exceptional taking care of my husband who had broken his leg and had to come on board on a wheel chair. Excellent care and attention. PROBLEMS WITH THE CAR, WE COULD NOT RENT ONE IN GRAN CANARIA, AND WE COULD NOT TRANFER TO ANOTHER ISLAND (TENERIFE) we discovered that the company offer the service from they office at the port. Thank. PS. It was a bit expansive for only an 1 crossing. We did not use restaurants and bar, but all looked well organised. We really liked the boat and the trip also. 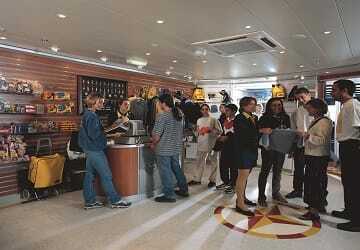 We're not young, I really felt good on the helpfulness of staff. Would highlight the service from Las Palmas to Agaete free bus took us to the boarding place. It is a pity that those who are not familiar with the local conditions, not to call the attention of: do no need to bring up the heavy packages in the passenger compartment can be placed in a locked compartment when boarding, which can be removed immediately, as he gets out of the way. But the staff also helped in the carry too. We can only recommend everyone who requires a comfortable, reliable, fast connections between the islands. Thank you. 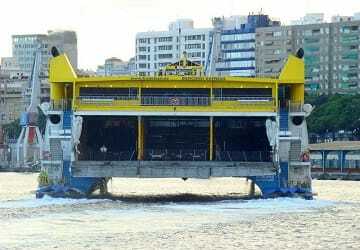 Very good travelling with this ferry. Helpful staff. "excellent trip, fast and comfortable"
"my travel to santa cruz"
They can put some serial Tv shortest than one hour. It is a way to have an entertainment. Everything was perfect and well organised. Both the outbound and return journey from Tenerife was very satisfactory! Great order, on time departures, calm and polite staff. Nothing to complain about - We had an amazing time! Thank you! "Happy with the company "
Truth be told I am really happy with the company. They looked very well after me and have no complaints. I recommend you travel with this company. Thanks for the treatment and see you next year. A very good crossing. It's a shame that we weren't informed that the bus from Agaete to Las Palmas was free. "Boat trip Agaete to Tenerife"
Well cared for. Purchased the ticket on the internet. The perfect way to travel between the islands, short duration, quiet atmosphere on board, it gets you the other islands very quickly.